This product was added to our database on Tuesday 9 April 2019. 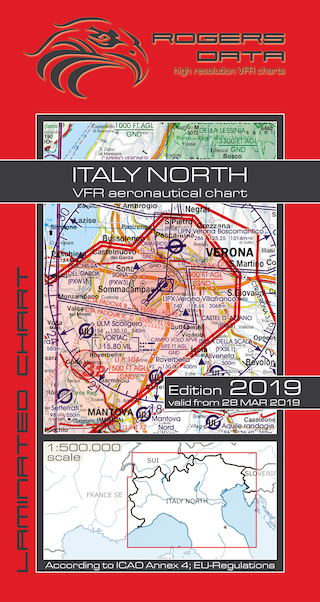 All Rogers Data VFR charts are now issued with their brand-new and unique RDtech lamination coating technology. The great benefit of the new and unique RDtech technology is that all Rogers Data charts are almost impossible to tear and can be folded many times. They are designed to withstand excessive use while also being safe and easy to use. Rogers Data VFR charts have a special laminate with a silk-matt finish that prevents reflections from the sun. And they can be written on using their optimized permanent RDtech-pen and still allows those markings to be removed residue-free with their optimized RDtech-fluids. Aeronautical chart on a scale of 1:500.000 printed on very high quality paper.